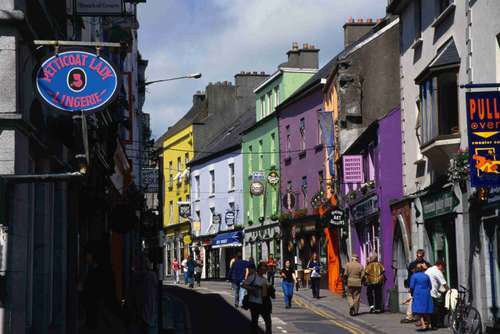 Galway is Europe’s fastest growing city and the fourth largest in Ireland. A lively university city of narrow streets, quaint shopfronts, bustling pubs and stunning surrounding scenery, it has always attracted a bohemian mix of musicians, artists and intellectuals. 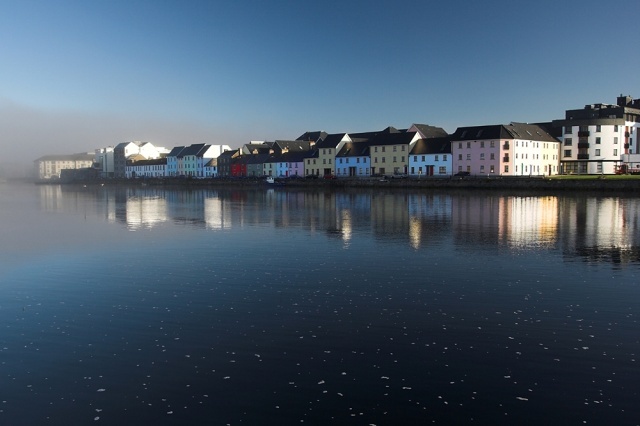 Lying on the banks of the River Corrib, Galway is a compact city and easy to explore on foot. Start your explorations in Eyre Square. This city centre square is home to two cannons from the Crimean war and a statue of the Galway-born writer Padraic O’Conaire. Stroll down William Street and Shop Street – the main routes into the city’s bustling “Latin Quarter.” The 16th century town house known as Lynch’s Castle stands on the corner of Shop Street and Abbeygate Street Upper. Now a bank, it was once the home of one of Galway’s most powerful ruling families – the Lynches. Shop Street is also home to Galway’s finest medieval building – the Collegiate Church of St. Nicholas. 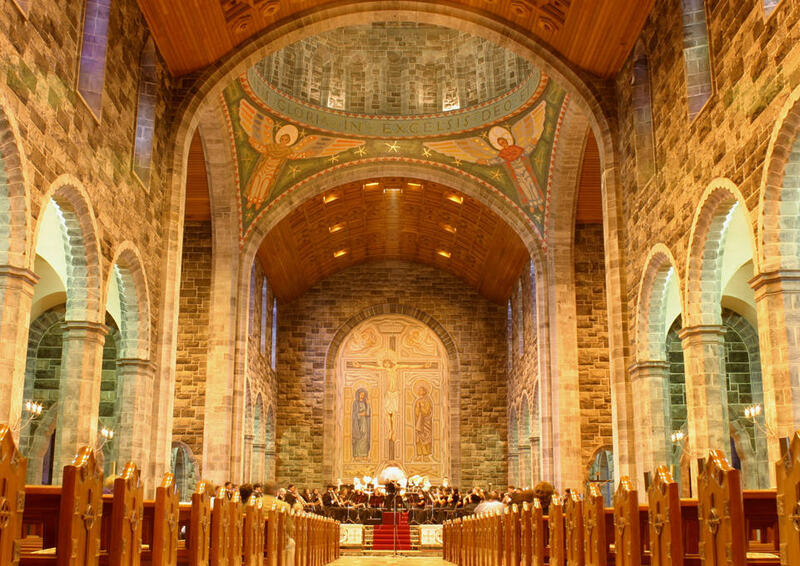 It is the largest medieval parish church in Ireland still in use. Stroll along the old quays and check out the 16th century Spanish Arch. Galway was originally protected by city walls and The Arch appears to have been constructed in order for ships to come into the harbour and unload their goods – often wine and brandy from Spain. If you feel like a swim or the thrill of the dodgems, head for Salthill, an old-fashioned seaside resort just west of the city. For a wide choice of excellent restaurants, head for the Quay street area. You’ll never be far from lively pubs in Galway and a trip to the famous Druid theatre is well worth it. There’s a great market on Saturday mornings beside St. Nicholas’s church selling everything from vegetables to paintings. Galway is also the gateway to Connemara – a region of spectacular beauty lying west of the city. A trip here is an absolute must. The drive from Dublin to Galway is 140 miles and will take approximately 3 hours. The N6 goes through Maynooth, Enfield, Kinnegad (take the first exit road off the roundabout just before Kinnegad town), Tyrrellspass, Moate, Athlone, Ballinasloe, Loughrea and Oranmore. Some towns are bypassed, with others the N6 goes through the main street offering a fascinating glimpse of daily life. On approaching Oranmore you will arrive at the first roundabout called ‘Oranbeg’ take the 3rd exit towards Galway City. The next roundabout is called ‘Carrowmoneach’ take the 2nd exit. The next roundabout ‘Martin’ - To the East. Take 1st exit (left) go through 1 set of traffic lights (past Galway Crystal) then straight onto the fourth roundabout (2nd exit past GMIT), then straight through two set of lights and Days Hotel Galway is located on your right. Galway city is known throughout the world for its love of the arts, the Irish language and its avant-garde culture! Situated at the mouth of Galway Bay, this lively city is constantly growing and is a popular tourist destination for many. Take time to explore the cities many relics of its medieval past. It has changed considerably over the last number of years and features a fascinating combination of new architecture mingled with the old. The centre of the city is conveniently compact enough to ramble around comfortably allowing you go from shop to shop effortlessly. Galway always has a buzz of excitement surrounding it. This could be from its eclectic mix of inhabitants to the colourful street entertainment – you couldn’t possibly just pinpoint one element that describes this buzz of what we in Ireland call the ‘City of Tribes’. In Eyre Square you can avail of some fabulous shopping along with seeing the famous statue of Padraig O Conaire, a famous Irish language writer. Standing on the banks of the River Corrib is University College Galway, an architectural masterpiece that lies just 10 minutes walk away from the city centre. Another site to behold is the infamous Spanish Arch, which can be found on the left bank of the Corrib, where Galway's river meets the sea. Galway is the birthplace of the world famous Claddagh ring, a souvenir many bring home, just to keep a little piece of Galway with them always. Claddagh is a small village just outside of the city. 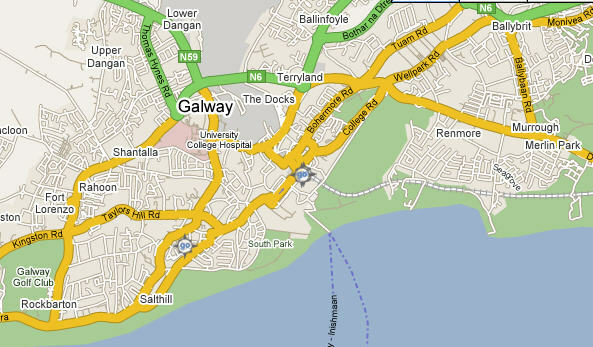 If you want to get away from the city why not take a trip here or to the nearby seaside resort of Salthill? Always a hotspot with holiday makers to Galway city!